Swann Galleries is to offer an outstanding assortment of more than 430 Vintage Posters at auction on Thursday, February 2. This sale, the first of Swann’s 2012 season, features some exceptional rarities, as well as iconic images from the U.S. and Europe. The auction opens with a selection of approximately 100 rare and important Art Nouveau posters, which features a stunning set of Alphonse Mucha’s The Seasons, four decorative panels, each in near perfect condition, 1896 (estimate: $70,000 to $100,000); and two variations of Mucha’s celebrated Reverie, one 1897, the other circa 1898 ($12,000 to $18,000 each). Of great technical interest is a group of six color proofs for Jules Chéret’s Libraire ed. Sagot / Affiches-Estampes, which offers insight into the poster printing process, 1891 ($2,000 to $3,000); a rare horizontal-format piece for The New York Symphony Orchestra, 1893 ($3,000 to $4,000); several images by Toulouse-Lautrec, including La Revue Blanche, 1895 ($25,000 to $35,000); and Jacques Villon’s L’Anti-Bélier, 1899 ($15,000 to $20,000). 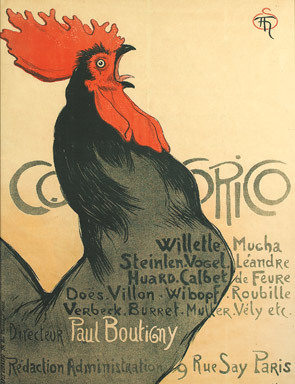 A rooster serves as the mascot for a literary magazine called Cocorico in a poster by Théophile-Alexandre Steinlen, 1899 ($12,000 to $18,000), which also appears on the cover of the auction catalogue. A run of posters of Judaic and Hebraic interest includes Miskovitz’s rare advertisement for the film The Promised Land, billed as “the first movie filmed in Palestine,” with text in Hungarian and Romanian, circa 1930s ($4,000 to $6,000). Steven Spielberg adapted this image for a poster promoting his Jewish Film Archive. There are also posters for the Jewish National Fund, the Palestine & Near East Exhibition, the inauguration of an international memorial monument at Birkenau, and more. There is a fine selection of Mather Work Incentive Posters, the workplace images created by a Chicago printer in the 1920s meant to boost productivity and good business practices. Highlights of these are an image of a steam-spewing locomotive with the tag line “No Lost Motion… Make Every Effort Count,” 1926 ($2,000 to $3,000); Don’t Touch Me!, featuring a prickly porcupine, 1929 ($1,200 to $1,800); and a racing sailboat in The Perfect Finish, 1929 ($2,000 to $3,000). The sale continues after a lunch break with a section of ski and winter resort posters from around the world. American examples include Ernest Haskell’s 1896 image for Truth Magazine, which is the first American ski poster, and possibly the earliest ski poster from anywhere ($2,000 to $3,000); 17 posters for the annual Dartmouth Winter Carnival, including some of the most striking and rare images from the late 1930s; Lou Hechenberger’s bright and colorful image of a female skier toting her skis in New Hampshire, 1941 ($2,000 to $3,000); and Sascha Maurer’s previously unknown Winter Sports / New England / The New Have R.R., circa 1937 ($1,500 to $2,000). Rare and desirable advertisements for Sun Valley, Idaho include Willmarth’s Summer Holiday, 1939 ($2,000 to $3,000); a rare variant of Dwight Clark Shepler’s “Round House” on Baldy Mountain, 1940 ($3,000 to $4,000); and Augustus Moser’s circa 1940 Union Pacific poster ($4,000 to $6,000). International ski posters of note are Emil Cardinaux’s Palace Hotel / St. Moritz, 1920 ($10,000 to $15,000); Franz Lenhart’s Sports Invernali in Italia, circa 1930; H. Ashley’s Ski at Banff in the Canadian Rockies, 1938; and Maciej Urbaniec’s Come and See Polish Mountains, 1961 ($1,200 to $1,800 each). There are more than 20 posters for the bygone magazine, The Saturday Evening Post, with iconic artwork from its covers by Joseph C. Leyendecker and Norman Rockwell, among others. The sale concludes with a section devoted to circus and Wild West posters, with highlights such as Count Orloff, known as “the transparent man,” circa 1900 ($1,000 to $1,500); an English and German language poster for Giant Beard Man, touted as the “man with the largest and most beautiful beard in the world,” circa 1900 ($1,200 to $1,800); and several Buffalo Bill pieces, including Buffalo Bill’s Wild West / Le “Poney Express,” 1900 ($4,000 to $6,000) and W.F. Cody / Buffalo Bill, circa 1905 ($12,000 to $18,000). The auction will begin at 10:30 a.m. on Thursday, February 2; and will continue after a lunch break at 2:00 p.m. The posters will be on public exhibition at Swann Galleries Saturday, January 28, from 10 a.m. to 4 p.m.; and Monday, January 30 through Wednesday, February 1, from 10 a.m. to 6 p.m.